I enjoyed reading the Beautiful Creatures series by Kami Garcia and Margaret Stohl. However, the movie left me sagging in disappointment as I walked out of the theater. While the books created multi-dimensional characters with interesting powers and an air of intrigue, the movie seemed to focus almost solely on immature teenage angst romance. Perhaps this is what the movie producers thought would appeal most to their target audience, but I think they were underestimating the intelligence and age range of potential viewers. The worst part was that it had such potential with an ideally suited cast of talented actors. With Jeremy Irons playing Macon Ravenwood, Viola Davis as Amma, and Emma Thompson as Sarafine, those imaginative characters should have leapt off the screen and left us breathless. I even didn’t mind most of the screenplay liberties with plot changes, such as combining the characters of Amma and Marian. I thought it worked. However, the movie allowed very little spotlight for these three captivating characters and brilliant actors to shine. Their screen time was whittled down to shreds, leaving very little opportunity for them to have the kind of impact in the story that they should have had. Surprisingly, I also thought the main teenage characters were well cast, with the almost unknown Alden Ehrenreich as Ethan Waite and Alice Englert as Lena Duchannes. They held promise, but their scenes and dialogue were so ridden with sappy, emotionally unrealistic melodrama that it left me wanting to pull my hair out by the roots. I’m surprised that fans of Garcia and Stohl’s books weren’t throwing things at the screen by the end of the film. While in the books, there was an underlying romance woven throughout the story, it was not the main cataclysmic focus of every chapter. It added strength to the characters rather than made them seem weaker and less mature, as was the case in the movie. 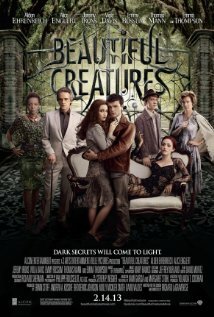 Thank you, I was looking at the ads thinking, oooo, great cast, but looks like a twilight redo.